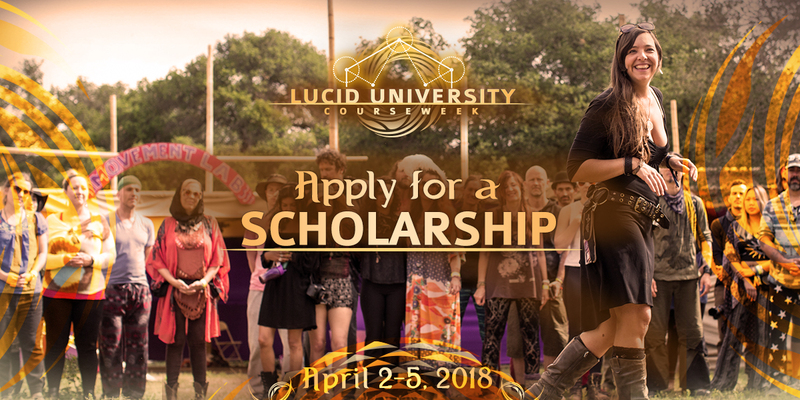 Apply for a Lucid University CourseWeek Scholarship! + a handful of partial scholarships! The past two years, Lucid University Courseweek was a huge success, with students from all over the country spending a powerful few days of learning on-site before the festival started. Read one participant’s experience here! Explore this year’s offerings HERE. We really believe this is a unique opportunity for our community. For all those who desire to grow, to learn, to up-level their world, we want to make it possible. Our badass international faculty isn’t hidden in some ivory tower, no sir! It’s always been important to us to open our doors to our programs open to everyone. To this end, we’re proud to announce a SCHOLARSHIP OPPORTUNITY. (It’s not a competition, it’s a co-opertition!). We’ll choose a full scholarship winner based on their answers to the questionnaire and we’ll select a handful of partial scholarship recipients as well. This contest application period will remain open until 11:59pm on Jan. 23rd. And winners will be announced shortly after. We are excited to announce three bonus tracks that incorporate the mind, body and spirit. This year we will be weaving our CreativeWorks, SpiritWorks, and BodyWorks content into a CORE curriculum that all students from all tracks will experience together.